At the end of last year, Smile Train UK won a High Court case against one of its former trustees, Brian Mullaney, who was ordered to repay more than £633,000 to the charity, which raises funds for cleft lip and palate repair operations for children in 87 countries around the world. The payments related to a time when Mullaney was also chief executive of Smile Train Inc, the US parent charity of STUK. He told the court that Smile Train Inc had agreed in 2007 that part of his salary, which averaged $750,000 (£451,000) in the years between 2007 and 2011, should be paid by Smile Train UK, which has been the most lucrative Smile Train charity outside the US since it was founded in 2006. Mullaney produced witness statements from five former senior Smile Train staff or board members saying that the US and UK boards had either approved or been aware of the payments, made in 2007, 2008, 2010 and 2011. The court also heard that the payments were noted in STUK's annual accounts, signed off by the auditors and by Mullaney as a trustee. But Master Marsh, presiding at the hearing, concluded that the payments had never been authorised in writing and contravened both charity law and Smile Train UK's articles of association, which do not permit payment of trustees. He ruled that the payments, plus costs, should be repaid by Mullaney, but pointed out that Mullaney might be able to claim them back from his former employer in the US. On 31 January, Mullaney remitted more than £750,000 to STUK. This unusual story is the latest twist in a dispute between Mullaney, a former advertising executive, and the man with whom he co-founded Smile Train Inc in 1999 - Charles Wang, the multi-millionaire former head of the software company Computer Associates and owner of the ice hockey team the New York Islanders. Smile Train Inc has brought lawsuits against Mullaney in the US as well. "I believe the STUK lawsuit against me was directed by Smile Train Inc board members in the US for purely personal and vindictive reasons," Mullaney says. A Smile Train spokeswoman says: "It is regrettable that despite legal actions against Mullaney in the UK and US that have been settled and/or resulted in court judgments, he continues to seek, and receive, a platform for his fanciful allegations. His claims have been wholly undermined by the outcome in both jurisdictions, requiring substantial payments by him to the charity." Susannah Schaefer, chief executive of Smile Train Inc and a trustee of STUK since last year, says in an interview with Third Sector that she believes it was justified in bringing the action against Mullaney in the UK. Before her appointment she was Wang's chief of staff and personal assistant for more than 10 years. "When it was brought to the board's attention just over two years ago that there had been these significant payments, we felt that we had an obligation to our donors and to children with cleft to tell our lawyers and the Charity Commission," she says. "Both the commission and the courts ruled in Smile Train's favour." Mullaney and Wang first worked together in the 1980s, when Mullaney handled the advertising for Wang's Computer Associates. 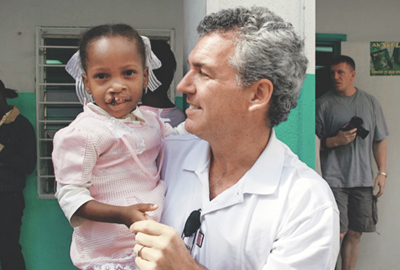 Later, they were briefly board members of Operation Smile, founded in 1982, which sends volunteer surgeons abroad to carry out cleft lip and palate surgery. But the charity they set up in 1999 had a different approach that involved training and funding local surgeons to do the surgery. Wang became chair of Smile Train Inc and Mullaney chief executive in 2002. Smile Train Inc has been highly successful, raising enough money to assist with nearly a million operations so far, according to its website. In 2009 alone, $90m (£54m) was raised. But in 2010 a rift began to emerge at the top of the organisation, which was described in a long article in The New York Times the following year. The main facts of the rift are confirmed by other sources, although interpretations differ. Schaefer was asked to comment on details of the dispute, but declined. According to the article and other sources, Mullaney raised concerns about the charity's high level of unspent reserves, which sources say had reached almost $130m (£78m); he argued that demand for cleft surgery was levelling out and the charity should work on other health problems such as club feet. But a proposal that the charity expand its work was rejected at a board meeting in February 2010. Later that year, a majority of the board voted to remove Mullaney as chief executive, overruling two members who argued that he should stay. In the end, he stepped down with a severance package but remained a board member. In December 2010, merger discussions began between Smile Train Inc, based in New York, and Operation Smile, the charity that Wang and Mullaney had quit 12 years earlier in order to start their own cleft charity. The proposal was that a new headquarters for the merged charity would be established in Virginia. In February 2011 Mullaney and two other board members voted against the merger, which was approved by a majority. In the weeks after the announcement, Smile Train donors representing some $7.9m (£4.7m) in donations signed an online petition opposing the deal, according to The New York Times. Smile Train called off the merger in March 2011. Wang said in a press statement at the time that this happened because both charities were spending "too much time and attention dealing with false innuendo, accusations, and allegations". Smile Train and Operation Smile remain separate. In the meantime, the reserves of Smile Train Inc have risen to $250m (£150m), which Schaefer says is financially prudent. "Smile Train Inc asked the charity to have funding there in the event that we would not be able to fundraise," she says. "Essentially, it's a rainy day fund - the goal was to have three years' worth of funds in case we can't fundraise. The money is held in an investment account that grows income, and it's good for Smile Train."